Upset stomach, indigestion, heart burn, diarrhea and other tummy troubles can really slow you down. 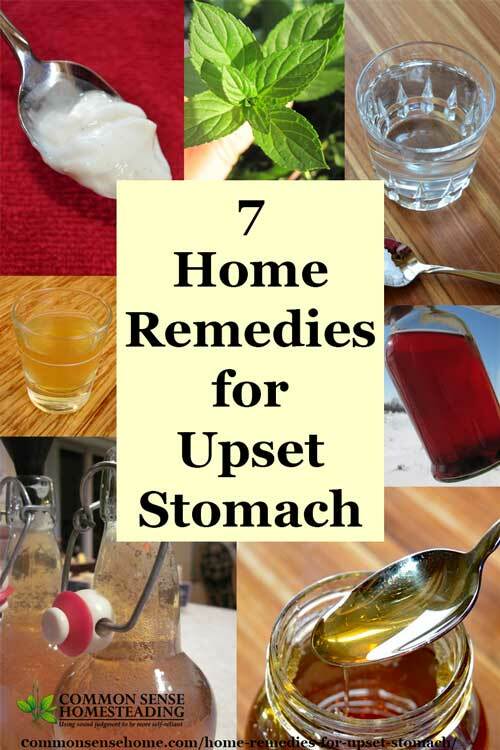 I've compiled this home remedies for upset stomach that may help soothe stomach pain, plus recommendations on how to avoid indigestion in the first place. If you're coping with stomach flu symptoms, you should take a look at The Best Home Remedies for Stomach Flu Treatment. For extra protection against food-borne illness, check out “Protect Yourself from Salmonella and E Coli Naturally“. When it comes to home remedies, apple cider vinegar has got to be near the top of the list as a “go to” for just about everything. For indigestion, most folks put a shot of ACV (roughly 1 teaspoon to 1 tablespoon) in a glass of room temperature water and drink it down. Some add a bit of honey to mellow the flavor. As we age, most of us produce less stomach acid, which bogs down digestion. A little extra acid helps get things moving again. Raw honey contains the enzymes diastase, invertase, catalase, glucose oxidase, acid phosphatase and inulase, which aid in digestion and assimilation. (See raw honey enzymes for more details.) Honey has also been found to be effective against E. coli and Candida albicans. Take a spoonful on its own for indigestion, or combined with your ACV drink. (Remember – raw honey will have the most active enzymes). Papaya fruit or papaya enzyme capsules are both effective at assisting with digestion. Papaya contains the enzymes papain and chymopapain, which are similar to digestive enzymes. Papain is used in many commercial meat tenderizers because it helps break down proteins. Enjoy some fresh papaya or take some papaya enzymes capsules, but don't expect the same results from dried papaya. The World's Healthiest Foods indicates that dried papaya is likely to be low on enzymes, which are heat sensitive. Look for organic papaya, as much of the papaya crop (roughly 80%) of the papaya crop is genetically modified. Activated charcoal is more likely to be effective for extracting problem substances than treating general upset stomach. Within hours of consuming the problem food, Health Guidance.org recommends keeping some activated charcoal on hand so that “it can be consumed in the scenario that a family member should ingest something potentially poisonous such as a medicine overdose, a household cleaner, gone off food, sedatives or narcotics. This will then reduce the body's absorption by up to 60% which could save their life. ” It should be consumed with plenty of water because it may cause dehydration, and should not be mixed with something like chocolate milk or syrup. For a sour stomach, add one half to one teaspoon of sodium bicarbonate (baking soda) to a glass of water, mix well and drink it down. Best for occasional use only, this fizzy drink can bring on a burp that may ease stomach pressure and will reduce acidity in the stomach. Caution: Do not use baking soda if your stomach upset is due to excessive overeating, as there has been at least one incidence of a man's stomach exploding from taking baking soda on a stunningly full stomach. Peppermint tea was my “go to” drink for pregnancy nausea, and I still find it soothing for mild stomach upset. Other herbal teas recommended for upset stomach include chamomile, catnip, cinnamon, fennel, ginger, green, lemon balm, licorice, sage, valerian and yarrow. 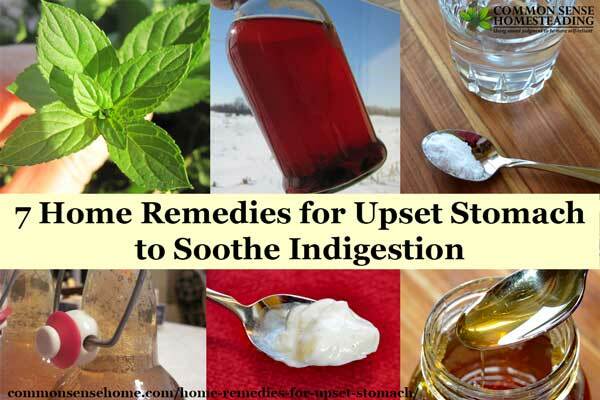 (Read more at “My Indigestion Remedies“.) In a pinch, if you don't have tea handy, strong mints (like Altoids) may have a similar effect. If I end up eating a less than stellar meal that does not sit well, the first thing I do is grab for a bottle of kombucha when I get home. Kombucha is a live culture food, which means it that contains friendly bacteria that help your body do its job. Milk kefir, water kefir, yogurt, kraut, kimchi or any fermented food will act to boost the populations of good microorganisms in your digestive tract. These are also very good to consume with a meal to avoid indigestion in the first place. You can make your own live cultured foods for pennies on the dollar with starter cultures from Kombucha Kamp or other culture providers. Some cultured food can be made with nothing but the base ingredient (such as vegetables) and salt. If you'd like more information on cultured foods, you can visit the live cultured foods section of our recipe page or check out the book “The Complete Idiot's Guide to Fermenting Foods“. If you pay attention to your body, you can probably figure out what's triggering your upset stomach, and work to heal it or avoid it in the first place. Consuming probiotics with your meal (as mentioned above) may help ease digestion. Also consider adding some acid to your meal, such as a vinaigrette dressing or a splash of vinegar or lemon juice. Bitter herbs and greens (such as chicory, endive, dandelion or other strong flavored greens) help stimulate digestive juices. Enjoy in moderation, don't stuff yourself. Chew slowly and thoroughly, giving your stomach time to recognize that it's full. Do try to relax when you get the chance, and avoid the other negative factors as you are able. When pregnant, be extra careful with anything you ingest. Mint tea is okay, but large amounts of chamomile, for instance, are not recommended. This post is for informational purposes only. If pain is severe, incapacitating or last more than 24 hours, please see a trained health professional. I’d stick with papaya, honey, or tea as they will taste alright if they happen to come back up. Hmmmm…I wasn’t thinking full blown “hurling” upset stomach, but that’s certainly a consideration. Pickle juice works well and it doesn’t taste too bad if you like pickles. The vinegar is easy and works immediately…it isn’t really gross since I just think I’m drinking a little salad dressing …so that’s not bad. I honestly wish I could tell everyone all the wonderful benefits. Helped me control diabetes since those pills were terrible & caused horrible/PAINFUL muscle cramping! It’s wonderful and kept me healthy…I haven’t gotten sick in almost a year– since I’ve taken it daily — 1tsp in 1/2 cup water/day. And I have 3 primary schoolers around me every single day. Please read and experience the benefits and see it for yourselves. The day I neglected to take my ACV “tonic” I ate my sister’s super gassy Chili beans and my and my daughter ‘s stomachs churned churned LOUDLY for hours & suffered until I remembered ACV. IT WORKED WITHIN MINUTES. How dumb was I to forget…. I hope this helps some of you. I have kidney stone or infection bad stomach pains anything to help???? Nice – I’ve tried several of these. Sharing on Fb. I am not a doctor and cannot diagnose or treat any illness. Given that it’s an antibiotic, probiotics may help get your system back to normal sooner. Looking at the side effects of Keflex, it seems that upset stomach is a common problem and they recommend not to take it on an empty stomach. I clicked on the link and scrolled to #2 honey. I read the whole article and comments. I read the material under baking soda. The caution about baking soda was not mentioned. What is the instance when baking soda should not be used? Please reply before I make the mistake. My husband is ill from eating very rare raw center prime rib last night February 14, 2015. at 6:00 p.m. He experienced great discomfort at 1:00 a.m. I have ACV, raw honey, baking soda and yogurt in the house. It is Sunday with an sleet storm promised for tonight and health food stores are closed. Grocery stores are open. What can I do for him. He has only taken Kroger’s antacid, “like Mylanta” and is drinking water. He is burping and in medium discomfort now at 10:15 a.m. . He is still taking an antibiotic for diverticulitis. What can I do for him now? I will check my e-mail in five and in 30 minutes. If your husband is in severe pain, take him to a healthcare professional. Please be careful. Given that he has diverticulitis and is on antibiotics for the diverticulitis, eating what he did was probably a poor choice and there’s nothing I can tell you over the internet to magically make his damaged and painful intestines stop protesting the abuse. Baking soda acts as antacid. If he’s already taking antacid, more antacid is not going to help. The guy who had his stomach literally explode from baking soda act an astronomically large amount of food – like something you’d see on one of those eating contests – and then he took baking soda. Peppermint tea is soo amazing for a grumbly stomach. It works faster than pills. I’m a peppermint tea fan, too. I used juice of kale to treat gastritis and this worked for me.Today I´m cured. A glassful of warm water with a little honey and a few drops of lemon juice added to it is good for improving digestion when taken on an empty stomach.